There's a line in a song that goes, "Every tool is a weapon if you hold it right"--and that goes double when your smartphone case has an extra edge. Like, say, a stun gun. This...makes quite the impression. It isn't unique, either--iPhone cases have been weaponized in multiple ways, gaining everything from DIY studs to a pistol shape to pepper-spray add-ons. There's even an armored iPhone case that will stop .50 caliber bullets (which is probably realistic only if you're the Professional Russian). Just for funsies, I spent some time with three standouts: the brass-knuckle-shaped Knucklecase, the SmartGuard pepper-spray case, and the Yellow Jacket stun-gun case. I'm sure you have questions already. Don't worry--the legal aspects of each product are outlined below, as well as what they were like to use for a week, and whether they're worth their respective prices. 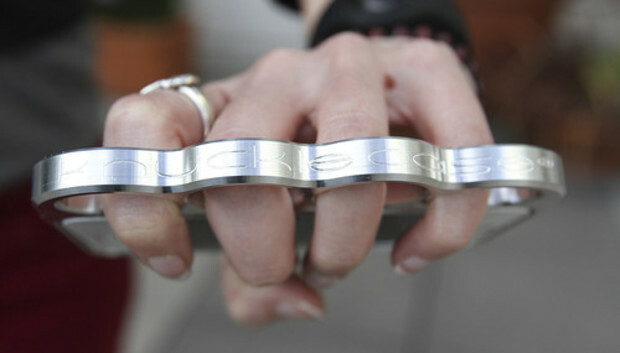 The Knucklecase isn't so much a weapon as it is a tool--"the ultimate tool for securing phone to hand," goes the tagline. Popping this case on is essentially like adding a handle to your phone. Imagine for a moment how convenient that is: You can pick up your phone with a crooked finger. You can loop it to a variety of buckles and loops on backpacks and clothing. You also never feel like your phone isn't firmly in your grasp. It's never in danger of slipping from your grip. I spent a few solid minutes shaking the encased phone, and although it began to slip a bit, shaking the phone out of the case would take a serious amount of force. And that's the feeling that the Knucklecase really promises. Crafted by U.S.-based machinists, each case is assiduously forged from a solid block of aluminum (is that not a waste of aluminum somehow?) and feels sturdy enough to add some sting to a punch. Not that such a thing is recommended, of course. Knucklecase's Terms of Service state that it is intended strictly for use as a handle, and that any other use forfeits any implied warranty for the product. You also agree, by purchasing the case, to "hold the company harmless for any misuse of the product, which results in damage." Those statements don't mean that such misuse hasn't already occurred in high-profile fashion. Jenna Jameson allegedly used the product in an altercation in Newport Beach, California--but hey, with starlets from Rihanna to Megan Fox to Cameron Diaz toting the Knucklecase, it was only a matter of time before someone used some bad judgment. Also worth noting: While the TSA reportedly no longer confiscates Knucklecases, the company recommends putting it in your checked luggage when you fly. If you travel frequently, this precautionary step may become a bother. The silver case I tested felt solid yet lightweight, and the details--such as the brand name carved into the knuckle portion--were neatly executed. The case itself is a bumper with a knuckle duster on the end; all ports remain easily accessible via cutouts, but notably the frame isn't raised, so your phone will be in direct contact with any surface you set it down on. A strip of spongy foam helps you ease the phone in and out of the case. Inserting the handset and removing it by pushing from the rear are both simple enough, and the phone seems set solidly in place. As I mentioned earlier, shaking the phone didn't dislodge it, although it did slip some. The Knucklecase feels like a top-quality product. It also has a top-quality price. While the iPhone 4 versions are currently on sale ($40), the 5 and 5s models will set you back at least a bill ($99 to $125). The iPhone 4 case comes in Classic Silver, Ballistic Black, Warm Gold, Hot Pink, and Green Camo. The 5s model comes in silver, black, gold, and Moonshine. A 5c version is in development. A practical option, the SmartGuard is a simple case with a quick-release canister of pepper spray attached neatly to the side. No muss, no fuss: Just pop the patented canister from the case, aim at the attacker, and get away. The coaxial nozzle delivers the spray along a center line in 6.5-second bursts. It has a range of 5 feet, and contains 10 percent Oleoresin Capsicum, which causes irritation to the eyes, respiratory system, and skin. If you find yourself in an unsavory situation, simply detach the pepper spray. The canister pops neatly in and out of the case, and an integrated safety tab prevents it from discharging accidentally (which might make you feel better about holding it up to your face). Although I will say that the "safety tab" is essentially just one more piece of plastic on a plastic case, I never felt as though I was in danger of the spray setting off. I must also note, however, that the canister popped in and out almost too easily. That sounds like a silly complaint, but here's my reasoning: After using and testing the case for a little over a week, I had popped the canister in and out a good number of times. Toward the end, I occasionally worried that the canister might come loose in my purse, as it was so easy to pull out from the case. It didn't, but I wouldn't have minded a sturdier locking mechanism. The case itself, too, could stand a little beefing up. The case consists of two parts: the back, which houses the pepper spray and features cutouts for all ports, and the front, which is a thin frame that snaps into place and secures the phone to the back piece. I wouldn't have objected to a bit more padding or rubber, although the canister-holster part of the case ensured that my phone remained raised above surfaces. Much like the other cases, the SmartGuard case comes with its own disclaimers: It's a crime to use the spray for any purpose other than self-defense, and the FAA regulates the ability to carry the spray on airplanes (which, again, means you'll need to put the item in your checked baggage). The case is from Piexon Self Defense Series and SabreRed; the websites include links to several FAQs and instructional videos. SmartGuard also has a free emergency app for iOS, but it isn't available to customers in the United States. The SmartGuard case costs $35 through Sabre's website and comes in black, white, or pink. I felt safe enough carrying it--although I usually carry pepper spray anyhow, it was nice having some so close at hand. Ah, the heavyweight. The Yellow Jacket is as serious as it gets, offering 650,000 volts that can either innocently charge your iPhone's battery or be purposefully discharged in defense of your person. There are some obvious legalities and consequences involved in the use of this product: In addition to the multiple bright-yellow warning signs all over the packaging, the guides inside list extensive details as to how the case is to be assembled and used. The Support section of the website, in addition to providing training videos, lists states, cities, and counties where the case is illegal. In addition to being very clear about what is and is not kosher with regard to operating this case, the Yellow Jacket comes with two safety precautions installed. To activate the stun gun, you must first flip down the cover of the prongs, then flip the switch and press the button to deploy. The device then makes a loud electrical noise, and sometimes smells of ozone, and if you're like me, you manage to scare the dozen or so people in your immediate vicinity before realizing that an office is probably not the best place to be testing such a case. The case itself is no joke. A big ol' slab of durable PC and ABS hard plastic with a hex-grip back and a two-piece assembly, the Yellow Jacket has LED indicators on the bottom, plus a switch that allows you to direct the stored power to your phone's battery instead of to the stun gun. Cases for the iPhone 4/4s are $99, and available in black, pink, white, yellow, or red. The company says that versions for the iPhone 5 models and the Samsung Galaxy S4 will appear in "late fall 2013." To assemble the product, you slide your phone into the case and onto the 30-pin connector in the bottom, and then you slide on the top portion of the case and lock it into place. This procedure sounds simple. In my tests it was not. It's a very tight fit along a specific angle, so you can easily overshoot it; the process always took me several tries. Once in place, the phone felt very heavy. Again, this case is not messing around. It weighs a strapping 4.6 ounces--almost as much as the iPhone itself. The combination did feel sturdy in my hand--"bricklike" is accurate but not intended as an insult. I can't lie: I felt pretty damn safe knowing I had a stun gun at hand, although I'll admit this essential feature is likely of more use if you walk with your phone in hand, which I almost never do. I got used to the weight quickly enough to the point where my original case felt flimsy and scrawny when I went back, and the battery feature came in handy pretty frequently. Charging the case takes a few hours (the website says four), and charging your phone using the case requires about an hour. And there is absolutely no way that thing is coming with you on a plane. C'mon. You know you're going to have to check that. It's also really huge for daily use--my phone refused to fit into a variety of pockets during my time using the Yellow Jacket case--but I was glad that I had it to change into, as it were, on nights when I knew I would be out late.